This 11-inch U.S.S. Enterprise NCC-1701 Star Trek Starship is a XL edition of the iconic ship from the classic television series. It's bigger than any Star Trek ship we've produced before and comes with a special collector's stand so that you can exhibit it with the rest of your collection, or as a standalone display! 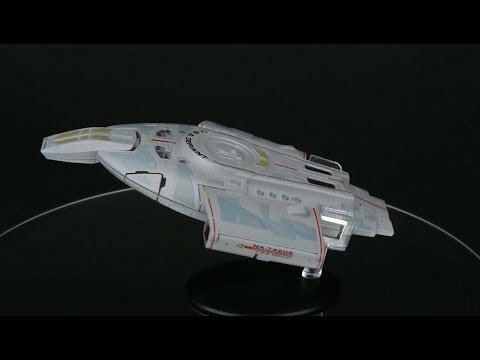 This model is die-cast, hand-painted, and comes with an in-depth magazine featuring product artwork, highlighting the ship's history design, and a breakdown of the technology on board, along with its crew and weapons. 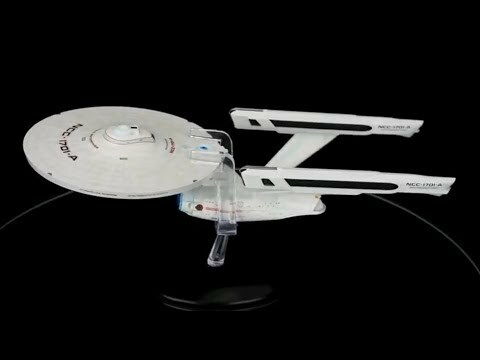 Go boldly with this XL Edition of the iconic U.S.S. Enterprise NCC-1701-D that navigated through the seven seasons of Star Trek: The Next Generation. Measuring 8.5 inches long, this detailed and faithful replica has been sculpted, die-cast and painted using references from CBS Studios' own archives of designs, and physical and CG models. Comes with an exclusive collector's magazine that provides an in-depth profile of the ship, with detailed annotations, and a breakdown of the technology on board, its crew and weapons. The U.S.S. Enterprise NCC-1701-E was a state-of the-art Sovereign-class vessel that entered service in 2372 and was the third ship to be commanded by Jean-Luc Picard. This XL edition of the starship Enterprise measures 10.5 inches long and is just as incredible as the ship from the show. The model itself is hand-painted with intricate detail, made from die-cast metal, and comes with a display stand. The Enterprise NX-01 was a NX-class starship in service of the United Earth Starfleet in the mid-22nd century. When the Enterprise was launched in 2151, she was the prototype of a new class of cruisers and was under the command of Captain Jonathan Archer. Her historic mission led to many first contacts and laid the groundwork for what would become the United Federation of Planets. This iconic ship in this XL edition brings every detail to greater scale, and makes an excellent addition to your Starships collection. 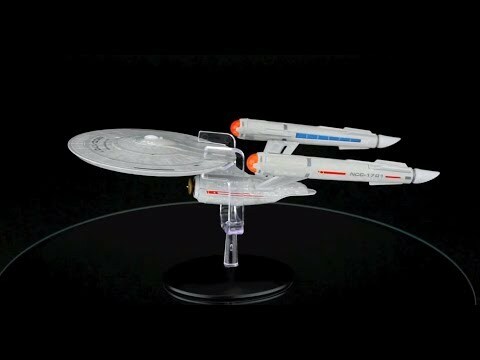 Explore the final frontier aboard the U.S.S Enterprise NCC-1701-A, with this sleek, die-cast XL edition. The ship came under the command of Captain Kirk in Star Trek IV: The Voyage Home after he saved Earth from being destroyed by a space probe, and subsequently appeared in Star Trek V and Star Trek VI. This U.S.S. 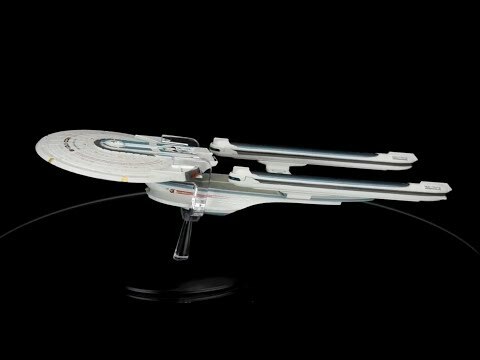 Enterprise-A XL Edition has been carefully recreated in die-cast, high-quality ABS materials, and is approximately 10.5 inches long. The U.S.S. Defiant appeared in Star Trek: Deep Space Nine (DS9) and the feature film Star Trek: First Contact. The XL Edition of this starship measures approximately 8.5 inches and cast in high-quality materials with hand-painted details. The U.S.S. Defiant XL Edition comes with a 20-page magazine with an in-depth profile of the U.S.S. 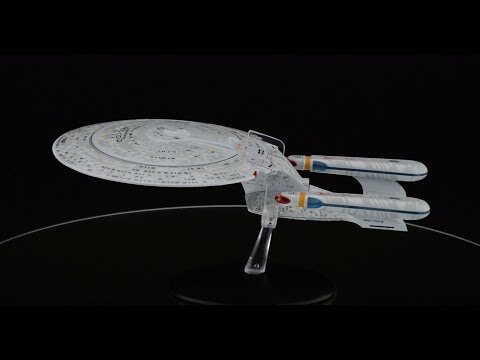 Defiant NX-74205, built in response to the Borg threat which was Starfleet’s first-ever warship and how the design of the U.S.S. Defiant evolved into its unique shape. The U.S.S. Enterprise NCC-1701-B is an Excelsior-class vessel was launched from Federation spacedock NAR-30974 in 2293. It is also the third Federation ship to bear the name Enterprise. The Enterprise-B was 467 meters long – more than 150 meters longer than its predecessor, the Constitution-class U.S.S.Enterprise NCC-1701-A. 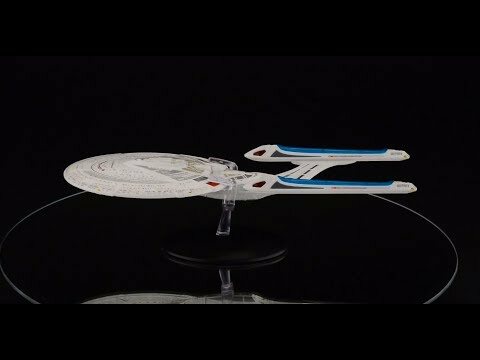 This XL Edition of the Excelsior-class U.S.S. Enterprise B has been carefully recreated in die-cast and high-quality ABS materials. It measures approximately 10.5 inches long and come's with a special collector’s stand. Inside the accompanying exclusive collector's magazine, find out about the making of Star Trek: Generations and filming the Enterprise-D saucer crash-landing on Veridian III. The Miranda-class vessels, such as the U.S.S. Reliant, were used primarily for science or supply assignments rather than extended exploration missions. As such, they were equipped with a host of scientific scanners. This XL Edition of the U.S.S. Reliant has been carefully recreated in die-cast and high-quality ABS materials. It measures approximately 8.5 inches long and come's with a special collector’s stand. Inside the accompanying exclusive collector's magazine, it features product artwork and highlights the ship's history and design. The U.S.S. Enterprise NCC-1701-C is an Ambassador-class vessel and the fourth Federation starship to bear the name Enterprise. The ship played a major key in fulfilling the Enterprise's ultimate legacy. After receiving a distress call from a Klingon outpost, the Enterprise-C arrived and destroyed the Romulans that attacked, an act of self-sacrifice by the Starfleet crew which impressed the Klingons. This lead to a close alliance of peace between the Klingon Empire and the United Federation of Planets. The starship U.S.S. 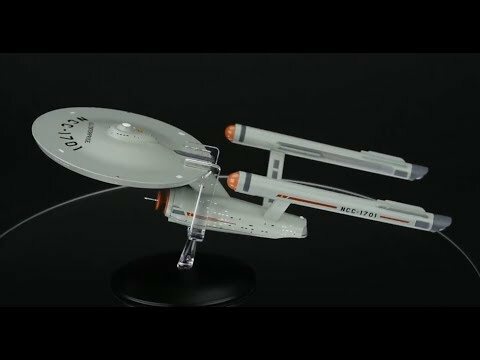 Enterprise NCC-1701 is back! The new Enterprise on Star Trek: Discovery is, in theory, the old U.S.S. Enterprise from the old Seventies technical manuals. Though its new design doesn’t alter the old ship as much as perhaps the J.J. Abrams films did, it still has some modern flourishes. The designs sit somewhere between the classic feature film version of the Enterprise, the Sixties ship, and the blue-color aesthetic of Discovery has established. Choose which ship to start with- you can pick any from our collection and save 20%. Pay only $75 $59.95 + free shipping today. Receive the ship of your choice this month and every following month you will receive a new ship to add to your collection! As a subscriber you will receive exclusive free gifts worth over $70 and qualify for other specials. No minimums. Cancel any time. As a subscriber you are guaranteed to receive every ship in the collection. You will receive 1 starships either every 6 week or every 8 weeks for $59.95 per issue and free shipping. 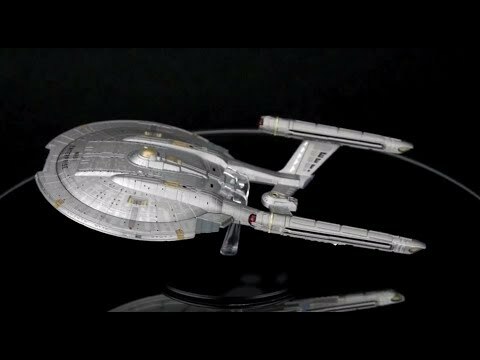 Star Trek Designing Starships Vol. 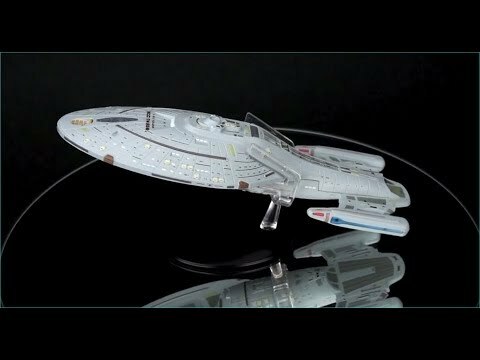 1, the story of how some of the most-talented designers in Hollywood created the now iconic starships of Star Trek, developing them hand sketches into the finished models that appeared on screen. 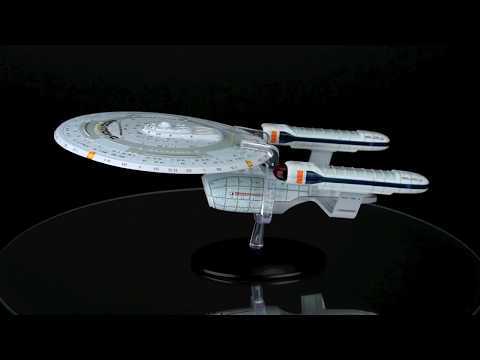 Star Trek Designing Starships Vol. 2. The book covers the genesis of 30 ships and is packed with original concept art and the evolution of the finished designs. It contains material previously published in Star Trek: The Official Starships Collection along with 30 pages of all-new content. There are currently 8 ships in the collection. Our customer services team can resolve this issue quickly. Please contact our customer support team at 1-800-261-6898 or email us at [email protected].com. If you email the team, please include your name and subscription reference in the subject line.